The National Champs is an event that is always held in high regard by both coaches and riders alike. It is therefore this Championship race that many build their entire race seasons around and the one that riders will aim to arrive on the start line in their best possible form. As a result, the National Champs always produces a exciting race, as riders take a ‘do or die’ approach to achieving a result. This year the Champs headed to the 2012 Olympic Games course at Hadleigh Farm, in Essex; this being a course that always guarentees some exciting racing – especially in dry conditions. 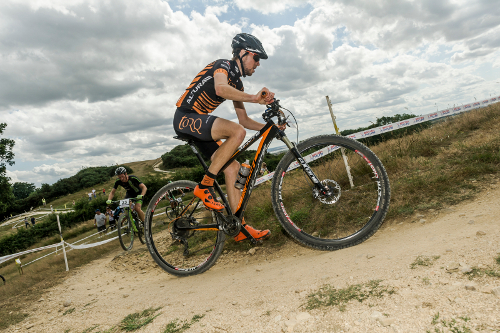 The TORQ Team were out in force for the race. 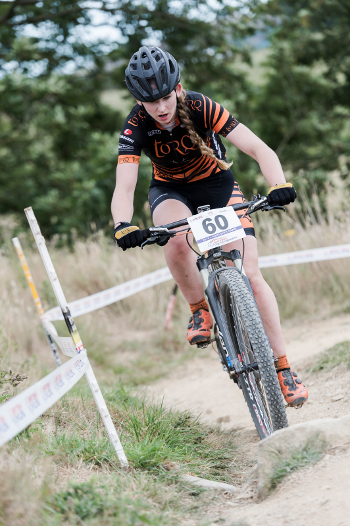 In the women’s category, TORQ Devo rider Lydia Gould kicked the day off with a Silver Medal in the Grand Veteran Category. In the Elite race, Jules Toone put in the performance of the day, finishing just off the podium in 4th – behind a number of full time professional riders. Jo Clay finished shortly behind in 9th, with Carla Haines in 14th. In the U23 race (after a season blighted with injury), Sarah Murray came away with a respectable 4th Place. In the Men’s race, Chris Andrews exceeded expectation to roll in 12th, despite a couple of small mechanical issues, with Lee Gratton in 16th and Endurance Specialist Richard Dunnett shortly behind in 21st. In the U23 Men’s category all eyes were on Alex Welburn, fresh off a 4th place finish at the previous round of the National XC series in Glasgow – where he out-performed many of his U23 competitors. Some great performances and results from all of the team. Next up is Bontrager 24/12 where the Men’s team will aim to take a win in the 12hour category after 9 consecutive wins in this category. Here’s how the race went from the individual riders’ perspectives. Sarah Murray – 4th U23 Female. Racing in a tough U23 field, I knew it would be a hard race. From the gun, I slotted into 5th place, and moved into 4th by the end of the start loop, with 3rd place just ahead. For the first two laps, I kept contact with 3rd, but I just couldn’t close the gap. I settled into a rhythm and worked nicely through the Elite race (which was set off one minute earlier). I was incredibly happy to finish in 4th place, as this is my first year of being an U23 MTB rider and to gain this position at this iconic venue was the icing on the cake. Jules Toone – 4th Elite Female. I’d never ridden at Hadleigh before and was a little unsure as to what to expect. I thought it could be pretty similar to Cathkin Braes and I found it to be just that – without the trees! It’s also pretty unique with good sea views! But with the exception of one tree root on one technical climb, I missed the trees! There were some good rocky technical descents, linked by gravel trails that were really, really loose. I enjoyed racing the course, it was so much fun, especially the fast berms and I liked the technical challenges on the climbs. We had 7 laps to race and I lost count of how many we’d actually done at one point. I found myself riding in 5th place for most of the race, trying to close in on Annie Simpson, who was holding fourth. I forget most of it now, as it was all a blur! When I passed Kerry MacPhee, I don’t think it really occurred to me that I was now chasing third. I just tried to maintain a constant pace, to keep my leg cramp at bay. It got me on the last lap though and I had to get off my bike and quickly stretch it out, to ensure I could get up the last technical climb. I finished 4th and I still don’t think it’s really sunk in yet – I can’t believe it! 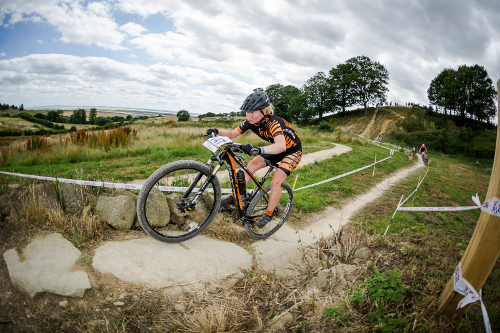 Alex Welburn – 10th U23. The prime event of the year. The one race, which, if won, would allow you to wear the British stripes all over your kit for 12 months. I was feeling really confident, off the back of a few good results. On race day, as soon as they gun went, my legs just weren’t themselves, I tried to hang on to the pace, but it just wasn’t going to be my day! 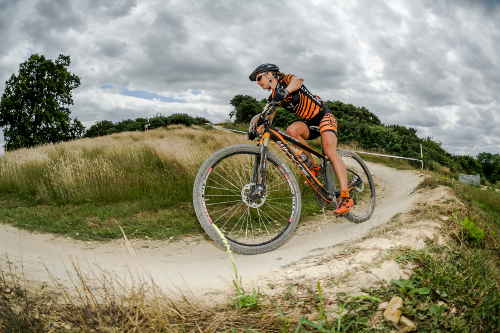 I crossed the line in a hugely disappointing 10th place – nowhere near the result I was capable of achieving; I’m now looking to put in a good performance at the Nationals at Cannock Chase, which will be a very local event for me. Lee Gratton – 16th Elite. Top weekend of racing at the National Champs. I’ve been itching to race the Olympic track for a while, but injuries had meant it’s eluded me, until now! It was well worth the wait though. The course was packed with really good technical sections, where there was time to be gained for sure! I got a few practice laps in and made sure I had all the A lines in the bag. I think as far as tracks go, this kinda had all the bases covered. So race time came! I was gridded back in 28th, so I was prepared to give it the beans – to make early progress. The start loop sort of made that a little easier than previous Nationals, which I was greatfull of! I got amongst it and battled my way up to 16th in the end! I’m really pleased with that and to be back healthy and riding my Whyte round the Olympic course was awesome! As always a massive thanks to TORQ and all our sponsors for giving me the tools for the job. Richard Dunnett – 21st Elite. This was my first time racing the National XC Championships and my first time lining up on the start grid with all of the Uk’s top Elite riders. I was excited, but unsure as to what to expect. I was gridded 31st on the grid, so gave myself the goal of moving up places and aimed for a top 20 finish. The start was a lot faster and more hectic than any other race I’ve competed in. After some jostling for a position, I managed to work my way up to about 20th position. I rode the first 3 laps well and had to push hard on the climbs, to make up for loosing time on the some of the technical sections – like the rock garden. Going into the 4th lap, I began to feel the earlier pace and had to knock my pace back for a lap or so, to try and recover slightly and keep riding smoothly so as to minimise my losses. As I went into the last lap, I started to feel strong again and pushed on, to make up one more place and finish in 21st position. Chris Andrews – 12th Elite. 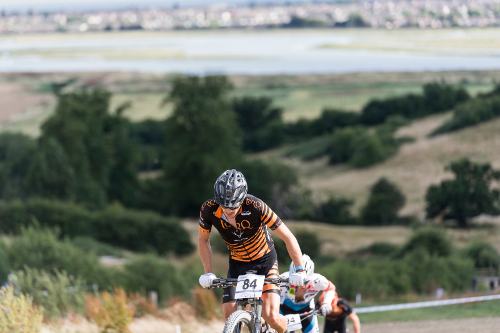 The last time I raced at Hadleigh was in 2011, for the Olympic test event. Four years ago I raced against some of the best riders in the World and in front of a huge crowd. It was the hardest race of my life!! Nothing yet has surpassed it. Having the 2015 National Championships here at the same venue was motivational and gave me a big confidence boost. 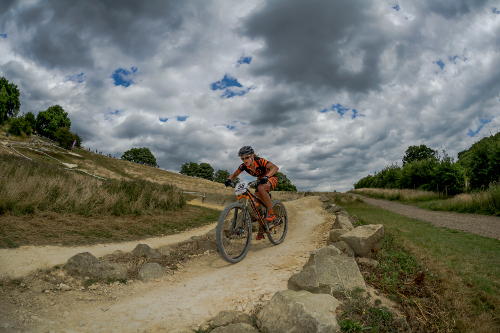 Although some of the technical features had been altered since then, the course was still very tough – with lots of man made rock features and no margin for error. Race day. 8 laps. I was ready! Nervous as ever, but feeling quietly confident, reminding myself about that race back in 2011. The whistle blew and I had a very aggressive start – which sometimes I lack. As we joined the course (after the initial start loop), I was inside the top ten and feeling strong. As I was riding down one of the last technical features on the course, my chain came off the front chain ring. I had to stop. I stayed calm and dealt with the situation. During this time, I kept hearing rider after rider going past. I jumped back on the bike and sprinted. ‘It’s not over!’ I kept reminding myself. I rode aggressively and started to pass rider after rider again, desperate to get back into the top ten. On the fifth lap, it happened again, the chain was off! This time I only lost two places and I sprinted up the climb and over took those two competitors within seconds. I was back in position and had my sights set on the guys in front. As the laps ticked by, I entered the last lap with a hard charging Richard Jones on my wheel. I knew this was going to be tough! Richard kicked on a small incline and gained a few seconds on me. I had nothing left to give. I had to give up that position and make sure I got over the line with bike and body in one piece. I was over the moon to finish in 12th position. I wanted a top 15, but to find myself in the top ten and fighting for position was great, on such a technical course. I’m slightly disappointed with the two issues I had. Without those, I believe I could have grabbed a top ten position. But that’s life. I’m still chuffed to bits! Thank you to Andy Whitehouse for the images in this report. Follow the team on Facebook and Twitter for the latest updates from the team.